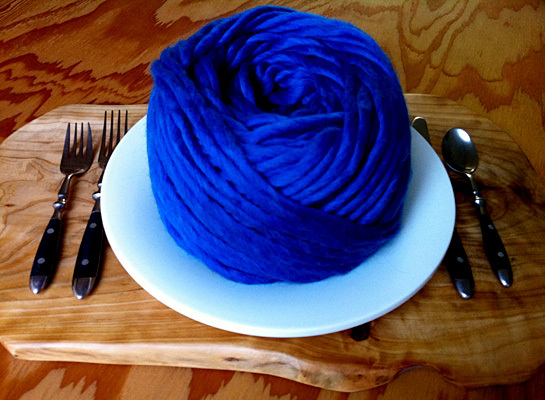 There’s a lot to love about super bulky yarns. I ran into Cascade Yarns’ Magnum when I went to knit the Big Lace Scarf from the aforementioned Hoverson book. The huge hanks hanging on the shop wall were to die for, but then when they’re wound! I died. So delicious I had to buy 6 or 7 colors. Out of curiosity, I went looking to see what others had used Magnum for and found myself at the blog of some lovely French lady who’d made a very simple garter stitch cowl in the round, out of the Mediterranean, the electric blue pictured above. So I made that one. And then I made more. And more, changing the stitch pattern each time. These are so simple they hardly qualify as patterns, and you can adapt them however you like. Like a larger circumference? Increase the cast-on count by 150% or 200%. Like a narrower or deeper cowl? Knit fewer or more rows accordingly. Want something drapier? Use a finer yarn and increase the cast-on count to compensate. All that really matters is the stitch multiple for the repeat, which is noted for each below. You could use anywhere from a size 15 needle up, depending how jumbo you want your stitches to be. Gauge isn’t terribly important here. These three were all done on 15s, but I’ve done others as big as 19s. Great for solids or stripes. For this one, I used the leftovers of all the skeins I’d used for other cowls, dropping one color and picking up a new one at random spots, for a gradual, casual transition. For clean stripes, you’d want to divide your color changes evenly among the ridges and always start a new color at the beginning of a purl row. 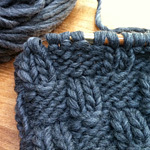 Repeat until cowl measures approximately 10 inches (about 20 ridges, or to your liking), ending with a knit row. For seed stitch in the round, you simply alternate knit and purl stitches, starting with an odd number of stitches, so that by the second round you’re knitting into each purl stitch and purling into each knit stitch. That way you get staggered knits and purls rather than ribbing, wherein the knits and purls line up. UPDATE Jan 2018: Please see the corrected version here. 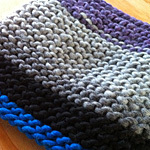 This entry was posted in Patterns, Projects and tagged cowls, free patterns, knitting. Bookmark the permalink. i love jumbo yarn! beautiful stitches, i have always wanted to do basket weave…. That one is my personal favorite. I’m planning to do a longer and wider one in an aran or bulky (rather than super bulky) yarn this year. 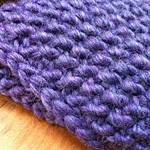 How long do you make the Jumbo Basketweave Cowl or how many repeats of the 20 rows? Hi, Connie — as noted above, just however many you like, but this one is 6 “strips” of basket. what is the total circumference of these patterns? Are the cowls wrapped around twice in these pictures? I don’t have one handy to measure (this was a long time ago, sorry!) but I’d say they’re probably roughtly 24″-26″ around. They are not doubled — they’re basically just a big neck cuff.